To be sure to get the pick-of-the-crop, we recommend that you arrive early in the day (or in the late afternoon) when the fruit is at it's coolest temperature, and you will be most comfortable too! Freshly picked berries are highly perishable - so protect them from sunlight and don't leave them in a hot car! 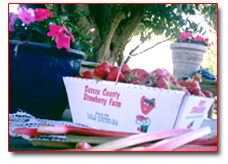 Fresh strawberries should be used within 2 to 3 days of picking. Store unwashed in the refridgerator or dark, cool area. Be careful not to crowd or press. Don't forget the ruhbarb for your recipies! We have over 200 "Macdonald" plants! Available by the bunch! Eating fruits and vegetables every day is one of the most important choices you can make to help maintain your health. Strawberries are a great source of vitamin C (28% more than an equal weight of oranges! ), providing an average of 77 mg per 100 grams (3 1/2 oz. )of fresh fruit. They are also an age-old diuretic, offering relief from rheumatism and gout. Strawberries are high in folic acid (a B Vitamin). 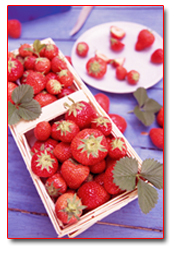 Just eight strawberries provide approximately 20% of the RDA of folic acid. Strawberries also contain ellagic acid, a substance that seems capable of fighting certain cancer-causing agents. On an average there are 200 tiny seeds on every strawberry. One cup of fresh strawberries has only 55 calories.